By fundraising and donating to the Ladybird Foundation, you are helping to give Western Australians access to high quality breast and gynaecologic cancer research. Want to raise some money but don’t know how? We have some suggestions that might help! There are many other fundraising approaches out there, so don’t be afraid to get creative! Everyday Hero is an easy to use fundraising platform that allows you to fund raise, track donations and share your progress with others. 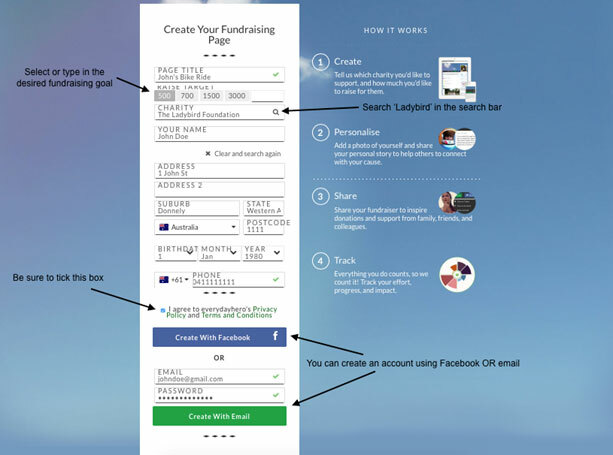 You can easily create your own Everyday Hero Fundraising Page for The Ladybird Foundation using the following steps. 3. Fill in the Fields as per below. Adding a story- why did you choose the Ladybird Foundation? Please contact us if you would like to host a fundraising event that does not come under an Everyday Hero Supporter Page as you may need to be aware of important requirements regarding Fundraising for a charity. If you are hoping to host an event for the Ladybird Foundation, we would love to send you some extra resources such as brochures and posters to help promote the foundation. If you would like to receive these materials, please visit our contact page to make a request. Otherwise, you can download the poster here(PDF) to print off at home. Thank you for supporting high quality breast and gynaecologic cancer research in Western Australia.